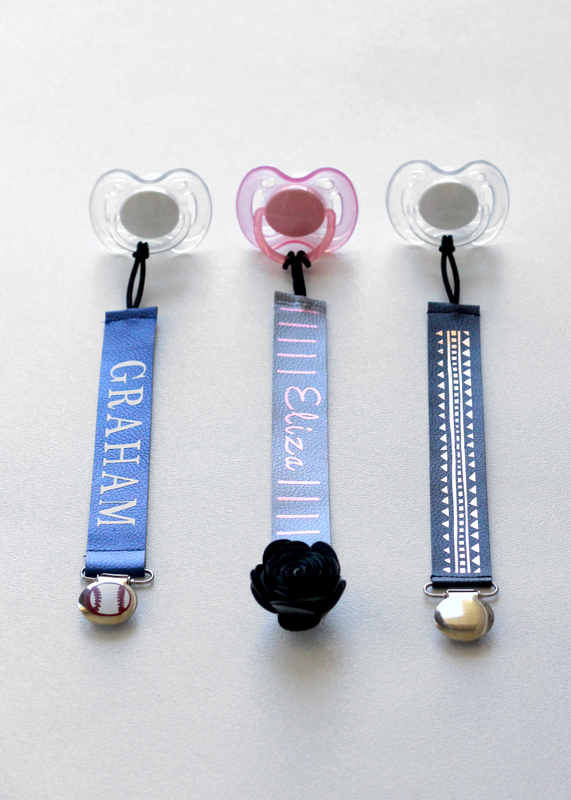 I needed some baby shower gifts and I really wanted to make something that was personalized. I searched, baby, on Cricut Design Space. This is the program that you use to make projects with your Cricut machine. I found this darling, Make it Now project for a binky clip!! This was the perfect project for my gifts! I love all the Cricut Faux Leather which is what was used in the project so I was excited. Have you ever tried using a Cricut machine before? If you haven’t you may not know what a “make it now” project is. These are projects that the Cricut team have already put together for you to make! Your next question may be..Will it be easy for me to use the Cricut software to create Make it Now projects? The answer is YES!!!! 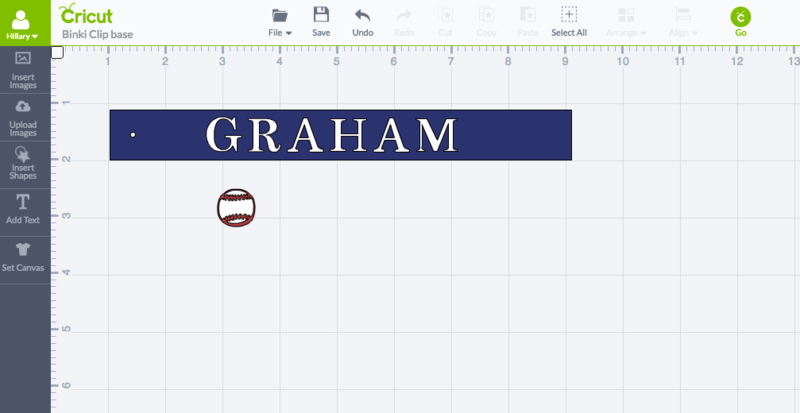 The Cricut team has done all the hard work for you and has made it so simple and easy! They have provided you with a description of the project, list of materials needed, and instructions on how to do the project!! It’s so awesome and it even provides the difficulty level and time it will take for the project. 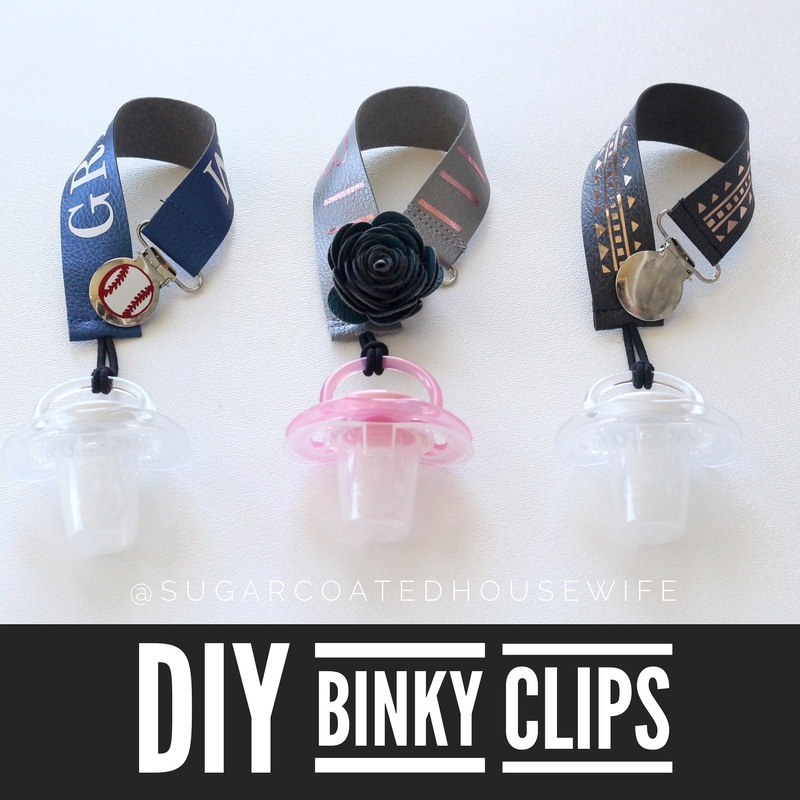 I made the Make it Now binky clip and then used the base to make 2 other binky clips. I have shared the tutorials for those also! Let’s start with the Make it now Project! 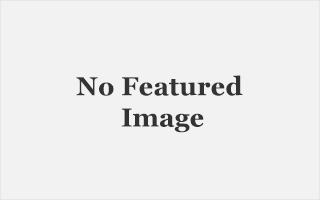 Search baby on the main page and it will bring up all the projects containing baby items or you can click–> HERE and get there directly. 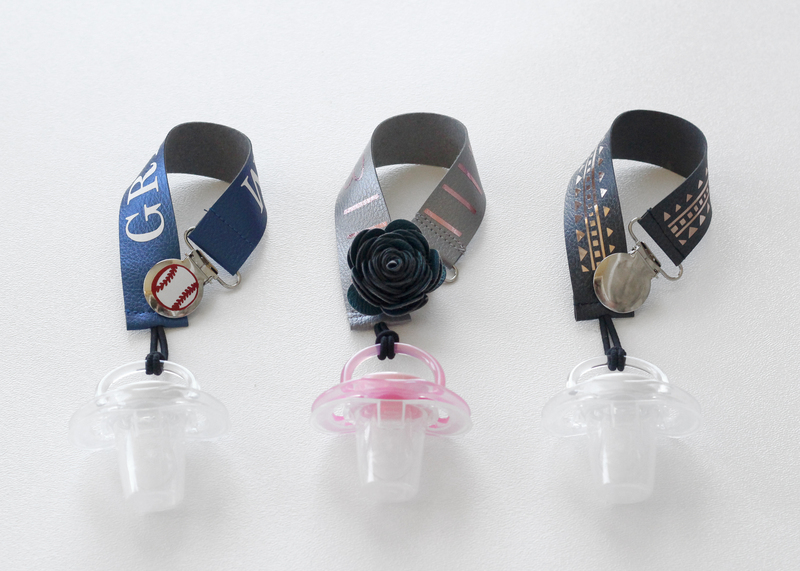 Select the binky clip project. All the instructions, materials, and description will appear. Click the make it now button on the bottom right corner. You will see that the 2 items are already sized and ready for you to cut. 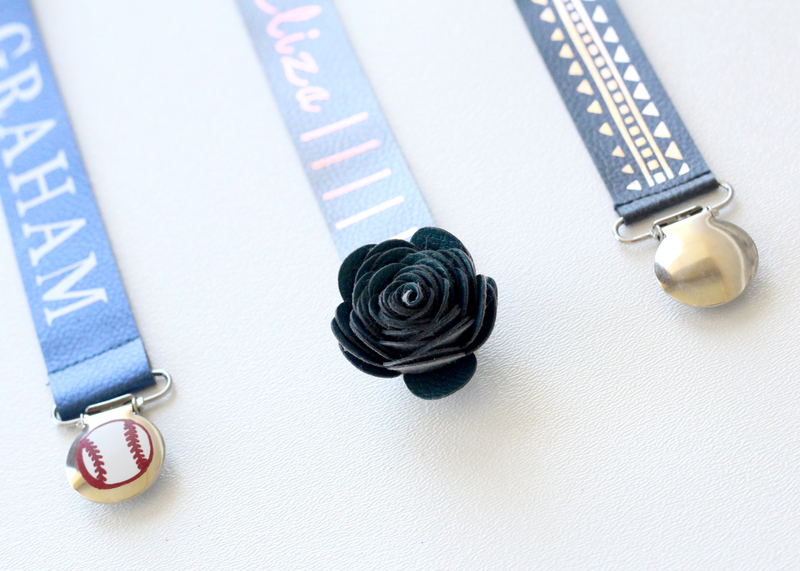 Choose your Cricut Faux Leather and vinyl that you want to use. Make sure and use a Strong mat for your leather. I have found in previous projects that this mat works best to hold the leather in place. I used the Charcoal leather and a Rose gold foil Iron-on. 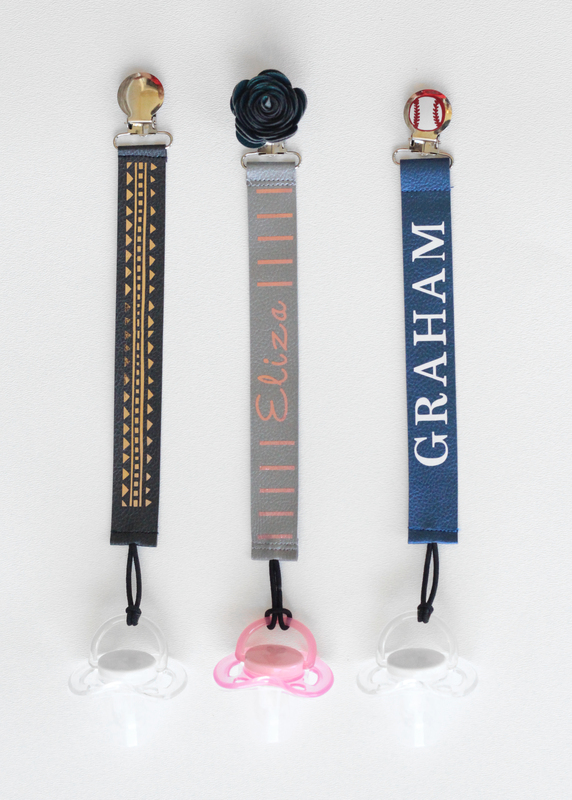 The base of the binky clip is what you will reuse for the other clips later on. When you have your mats ready click go and it will guide you through cutting out your materials. make sure and remember that in the instructions is says to mirror your image for the iron on material. Do this before you click GO so that you can just switch out mats when its done. 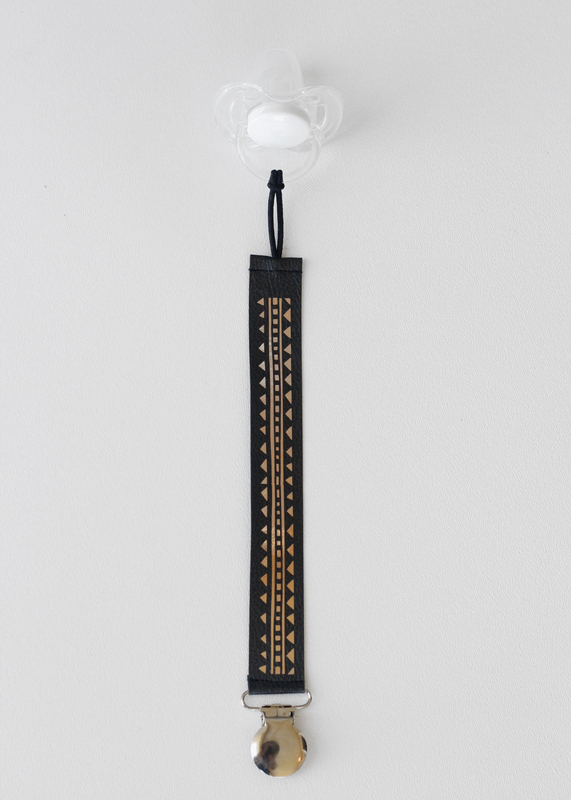 Follow the rest of the instructions to iron on the material and attach the cord and the clip. How easy was that!! I love that it was quick and easy to make. Let’s make some customized ones now!! 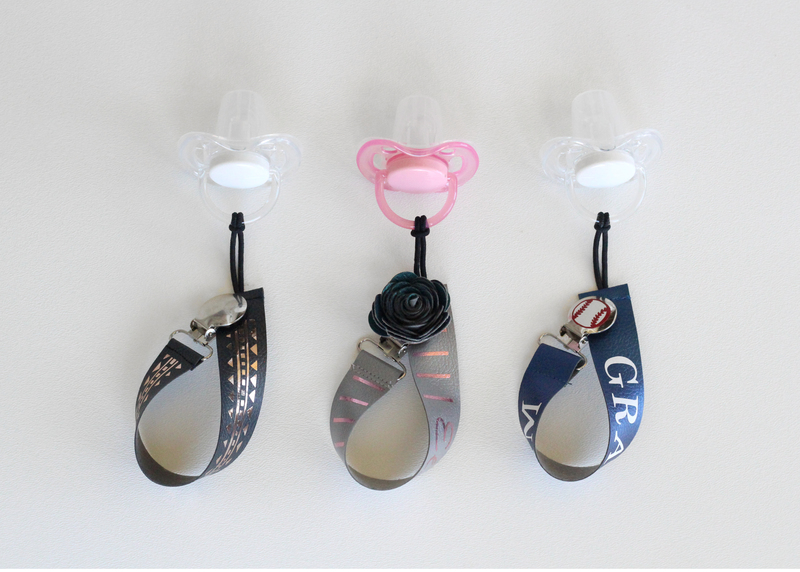 The next 2 clips I added the names of the babies to them. All to often are we with all the family and one of the kids have taken theirs off and everyone is asking who’s it is. I thought this would be perfect! This one turned out so cute. 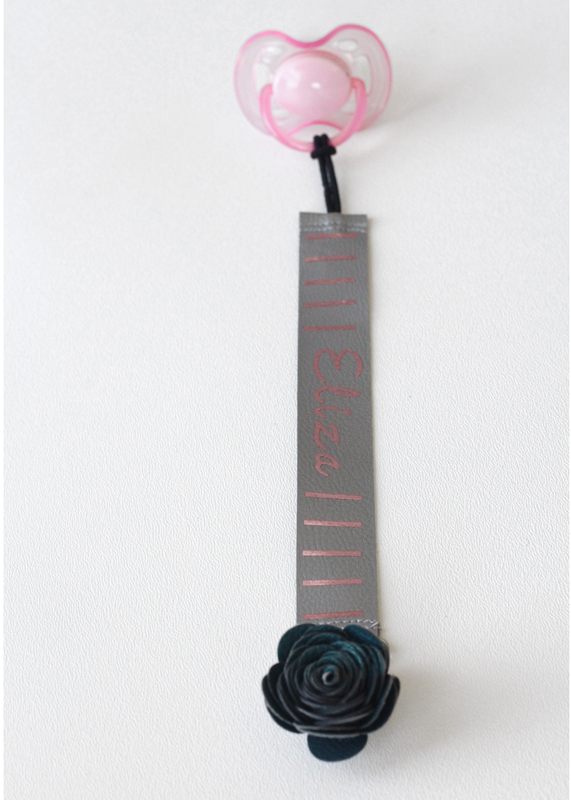 I used the Silver Faux leather and the Pink foil iron-on. 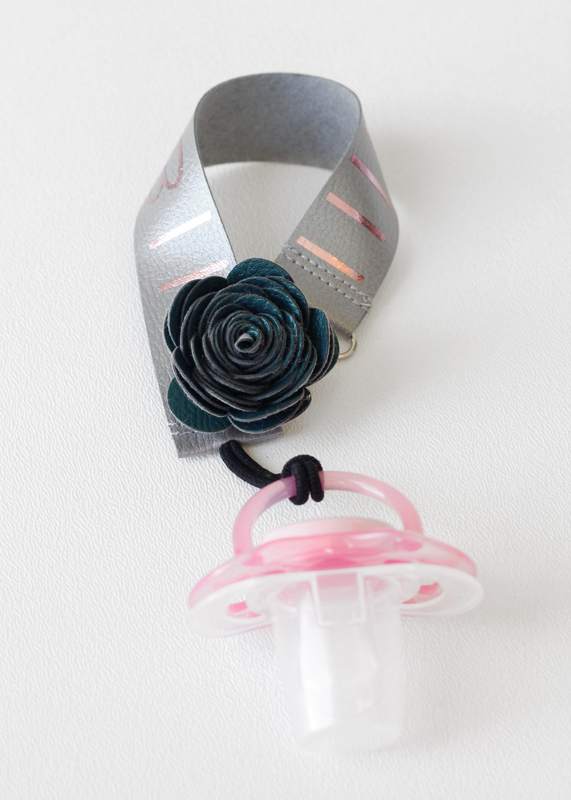 Then I made a fun leather flower to add a little extra cuteness!!! I used this image to cut the flower. You can find it under 3D Flowers. To create the binky clip open up the Make it now project for the first binky clip. Before clicking, make it now, click the customize button right next to it. This will allow you to drag the cut out image off the background and then delete it. This will leave you with the base for the next clip. Add text and choose the font you want it in. Adjust size. to add the lines, click on the add a shape button. Choose the square. click on the lock on one of the corners to unlock the image and you can drag and resize it to look like a little line. when you have it the size you want, click the duplicate button 3 times. Line them up and then select them all and group them by clicking group at the bottom right corner. Duplicate that image and you can put that on the other side of the name. Select all the lines and the name, you will want to weld these together so they will all cut how you had them lined up. Once you have it attached you can click GO. Make sure and mirror the image for the iron-on. Cut the images and iron it onto the leather. Cut the 3D flower. Use the tweezers to hold onto one end and roll the flower into a tight flower. Hot glue it together at the bottom. Hot glue it onto the end of the binky clip. 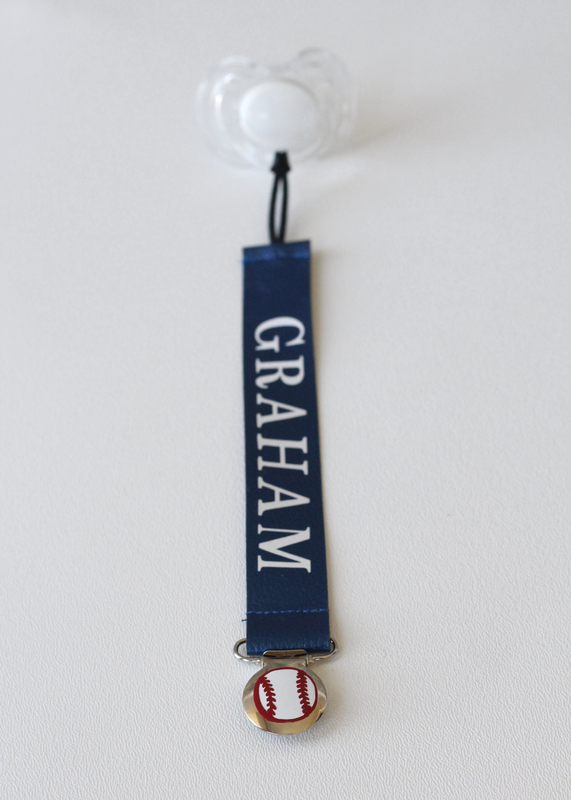 Little boys baseball clip. Use the same image as the previous 2 clips. add text for name. Adjust font and color to what you like. Search images for baseball. This one i chose did have a background so i added a circle and adjusted the size to fit. Group them together by clicking the attach button on the bottom right corner. This will allow you to move it around and change the size to what you need. I made mine .60″ in diameter. Click GO. Make sure and turn mirror image on for the name. 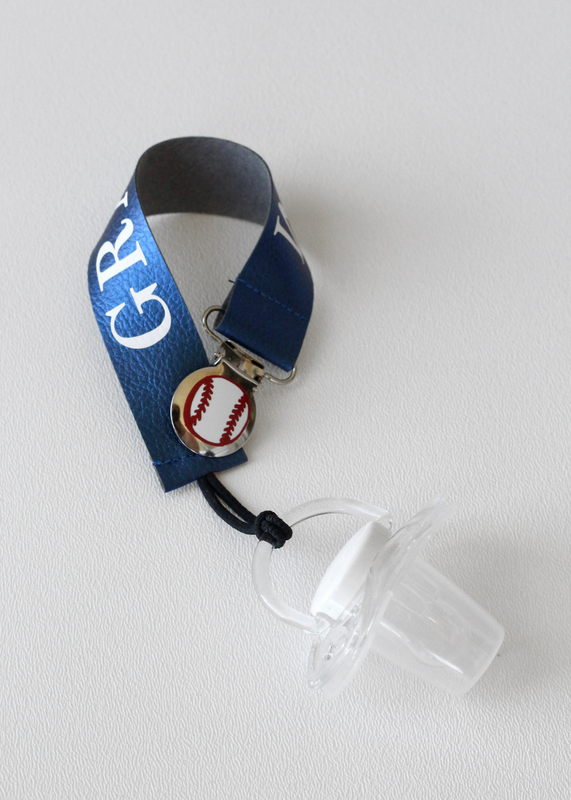 The baseball will be vinyl so it will stick on the metal binky clip and it will not need to be mirrored. 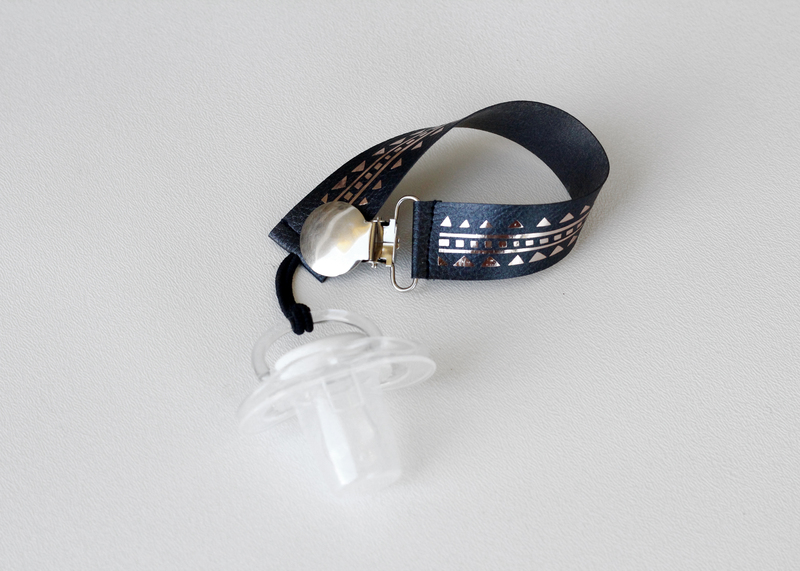 Iron on the material and follow the instructions on the 1st binky clip to attach the cord and the clip. I am so excited to give these gifts to my friends. 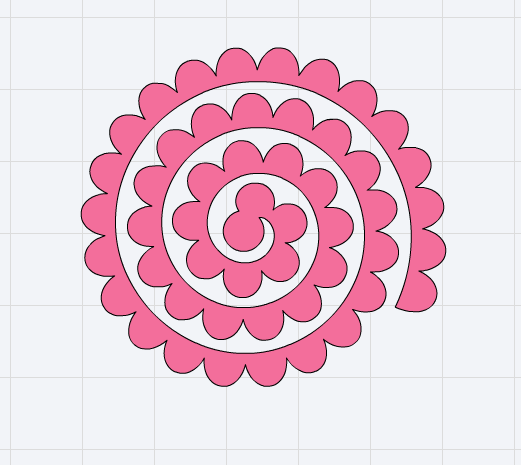 The Cricut machine is so fun to use and you can make so many projects. If you are nervous about having to come up and create something on your own just remember that there are Make it now projects. You can use them as is or you can customize them as we did here. If you don’t have a Cricut yet you can get one–> HERE I absolutely love my Cricut and I know you will love yours too!! Previous ArticleDOES THE CRICUT MACHINE REQUIRE CARTRIDGES?? Next ArticleWILL YOU USE THE CRICUT ENOUGH TO JUSTIFY THE PRICE?